Cleary University is also featured in our ranking Top 25 Most Affordable Online Bachelor’s in Accounting. 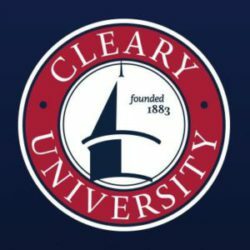 Cleary University is a private school based in Michigan that focuses on business degree and programs. With locations in Detroit and Ann Arbor, the university has just over 850 students attending classes. The majority of students are enrolled in undergraduate programs, but the school also offers graduate degrees. The primary degree offerings at the school include an Associate of Business Administration, Bachelor of Business Administration, and Master of Business Administration, as well as certificate programs. Cleary University was founded in 1883 by a man named Patrick Roger Cleary who called the institution the Cleary School of Penmanship. The school’s official colors are red and blue, and the school mascot is named Clancy the Cougar. There are several degrees in accounting available at Cleary University at various levels of study. Students may choose from an Associate of Business Administration (ABA) with a concentration in Accounting/Finance or a Bachelor of Business Administration (BBA) with a concentration in Accounting and Finance (CMA Track). The school also offers a BBA in Public Accounting. A student’s career goals will dictate which class will serve the student best. For example, an Associate of Business Administration with a concentration in accounting and finance may help a budding entrepreneur understand the fiscal responsibility required in starting a business. Meanwhile, a seasoned employee may wish to seek a Bachelor of Business Administration for career advancement. One of the valuable features of attending classes at Cleary University is the Certified Management Accountant (CMA) Exam Preparation course. Students in accounting courses may wish to enter the class to gauge their proficiency in knowledge areas required for the test and by The Association of Accountants and Financial Professionals in Business. There are more than 50,000 Certified Management Accountants working in the United States, and the profession offers excellent career opportunities for rewarding employment. The class is offered twice each semester and is taught by a CMA with a Master of Business Administration degree. Topics in the program include external financial reporting decisions, performance measurement, internal controls, and planning, budgeting, & forecasting. For students looking at entering college at the bachelor’s degree level, the concentrating in Accounting & Finance within the BBA program at Cleary University is appropriate for students who wish to move into management-level careers in accounting and business. Students are also offered a curriculum that helps them prepare to take the Certified Management Accountant examination. Many graduates enter public or corporate accounting and experience a balanced curriculum that includes project-based learning and case studies. Courses a student will take in the BBA program include Principles of Accounting, Accounting Practicum, QuickBooks, Introduction to Taxation, and Intermediate Accounting. Careers available to graduates include those as financial managers, credit managers, business consultants, risk managers, controllers, and corporate accountants. Students who are interested in entering the profession as a Certified Public Accountant (CPA) will want to consider the Bachelor of Business Administration with a concentration in Public Accounting. Completing the degree can help students complete some of the courses required to qualify to sit for the CPA exam in Michigan. Courses a student will take include Cost Accounting, Corporate Taxation, Individual Taxation, Accounting Information Systems, and Advanced Financial Accounting. Some of the areas where a student may work after graduation include jobs with responsibilities like performing audits, preparing financial statements, and providing tax and financial advice. Students who want to work as a CPA will definitely want to consider this degree, but future businesspeople with an affinity for mathematics, budgeting, and numbers will also want to consider this track. The Higher Learning Commission has given Cleary University accreditation to award degrees and is also recognized by the State of Michigan with a license to operate. The Higher Learning Commission is a nationwide group of accrediting bodies that accredit schools across the nation and operate under the Council on Higher Education Accreditation (CHEA). The school is also a member of the Academic Quality Improvement Program (AQIP), which is a program designed to help institutions of higher learning maintain their accreditation with the Higher Learning Commission. As a non-profit, private university, Cleary University is registered as a non-profit corporation by the Michigan Licensing and Regulatory Affairs Department. There are four steps in the application process at Cleary University. The first step is to complete the official online application and pay the application fee. Undergraduate applicants will pay $35, and graduate applicants will pay $60. The second step is to send official transcripts from the student’s previous school to the university. For undergraduate students, that will include high school transcripts. For graduate students, that will include transcripts from the student’s undergraduate university. The third step is for graduate students only and includes sending a resume to the university. The final step is submitting a FAFSA form to ensure eligibility for financial aid in the event of enrollment in one of the programs at Cleary University. Cleary University is a private school and charges the same amount for tuition whether a student is from Michigan or another state. New students will pay $19,500 for one year of tuition, and continuing students will pay $17,900. Students who choose to live on campus will pay $9,600 for room and board, and the college estimates that off-campus students will pay $4,614 in room and board for the year. Other fees at the university include a loan fee, the cost of textbooks, personal costs, supplies, a Student Activity Fee, Technology Fee, and transportation. In all, a student may expect to pay between $27,649 and $33,569 for a year of undergraduate education at Cleary University. Graduate students can expect to pay between $20,782 and $36,781. Students attending Cleary University are eligible for a variety of financial aid types including federal, state, and private aid. Federal loans include awards like Pell Grants, which are awarded to first-time seekers of bachelor’s degrees who demonstrate a financial need, as well as Supplemental Educational Opportunity Grants, which are also awarded to students eligible for Pell Grants. Assistance available in the State of Michigan includes Michigan Tuition Grants, Michigan Competitive Scholarships, and Tuition Incentive Program awards. Students are also eligible for federal student loans like Stafford (Direct) Loans, Parent PLUS Loans, and Grad PLUS Loans. Students at Cleary University may also receive a work-study grant that will provide the student with a job at which to earn money while enrolled in school.